An exhibition or trade show is a fantastic way to show off your products and services and meet new customers. Exhibitions are great for gaining insights into your customer and the industry, and leads to impressive sales. No matter how easy digital marketing makes itself look, no marketing method has the face-to face power of exhibitions. There’s an exhibition for almost every topic, from car shows to comic con, business studies to weddings. These shows often span large exhibition halls which hold thousands of like-minded people. There’s no better way to get in front of people who are definitely interested in what you’re offering. But booking a stand and attending the event is just half of the story. Stand design plays a huge part in how successful your exhibition efforts are. In a recent survey, Display Wizard reported that nearly 50% of surveyed exhibitors say a well-designed, eye-catching stand is the best method for attracting people at events. It’s really important. There’s no definitive method for stand design. How you approach it depends on your branding and your products. 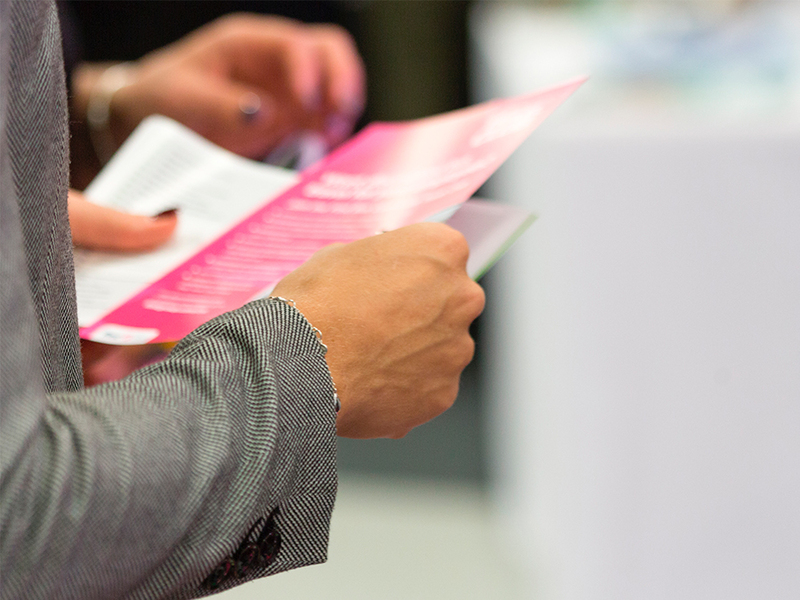 To help, here are our top tips and recommended products to make your exhibition stand a success. When you book exhibition space it’s usually just that – a space. Sometimes with partitions to separate the stands next door. It’s a completely blank canvas for you to create a striking statement. Your branding is your identity, so you need to make sure your stand fits in with the style of your business. Your exhibition stand needs to look like it belongs with the rest of your marketing making you instantly recognisable and sticking in the forefront of customers’ minds. If your brand is colourful and quirky, for example, your stand should be the same. Colours, patterns shapes and so on should all link to your company brand. The next step is to work out how to apply your brand to your space…. Our exhibition stands are handy marketing and advertising tools, designed to grab the attention of customers and clients at exhibitions, events, expos and conferences. There’s a variety of different size and shape options to help you find the right fit for your exhibition area. Once you’ve chosen a stand, simply download the template, design the artwork and we’ll print it on a durable, high-quality stand frame. 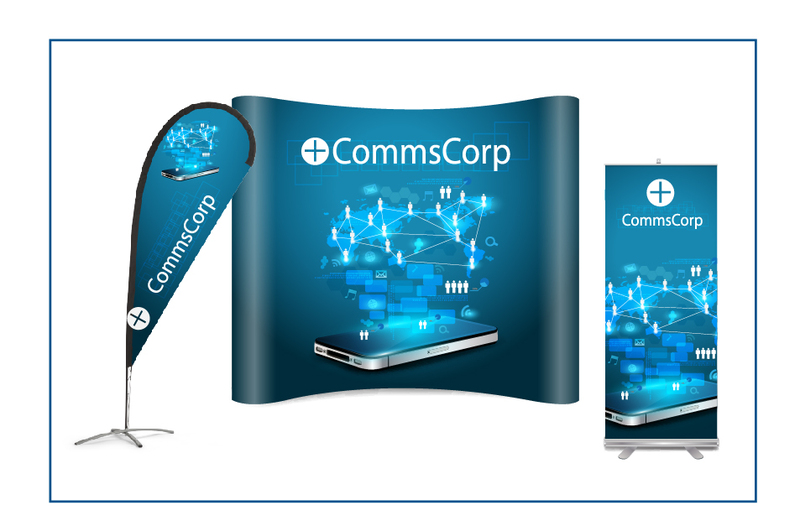 Not only are our exhibition stands a striking marketing tool, they’re convenient, lightweight and simple to install. Our exhibition stands can be moved between events effortlessly, making it easy to get in front of the right people, time and time again. No matter where you use it, your stand will be synonymous with your brand, easily recognisable and really simple to put up. Your stand is effectively like a shop window. You want it to shout “come on in, this is us” and give passers by an instant feel of who you are and why they should want to talk to you. Along with its design, the location of the your stand is really important. Before the show, contact the event organiser and ask for a detailed map of the hall, indicating where your space is. Knowing where your stand will be in relation to other amenities will be a huge help when thinking about positioning. For example, if your stand is near a dining area, try to position it so it can be seen from the area where people are congregating. You’ll catch the eye of someone which will encourage them to visit you. It’s also handy to work out which way visitors are most likely to approach your stand. Research the venue and try to look at videos of other events there to gauge which direction people walk round the hall to indicate where you should be positioned. This is where our range of roller banners come in handy. 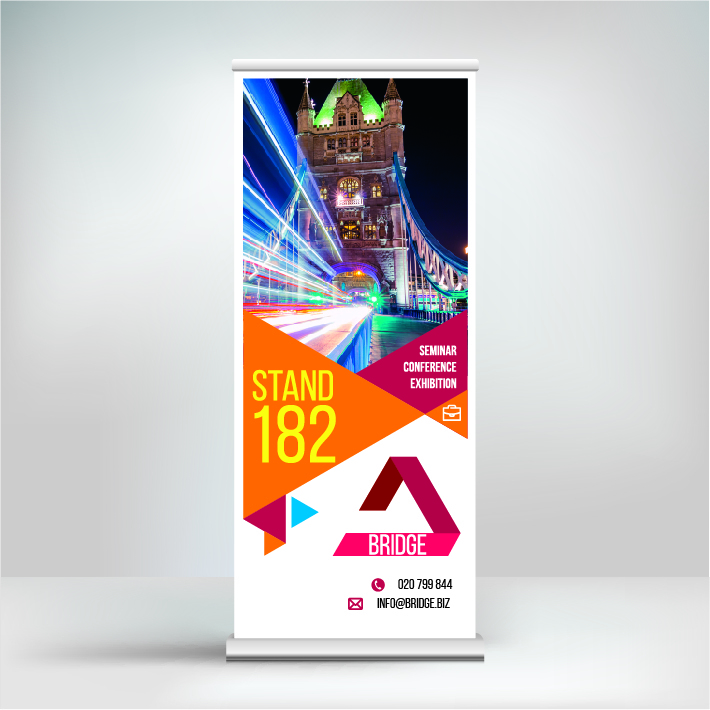 Roller banners can be positioned around your stand facing different directions so no matter where someone is approaching from, they can spot you. This also adds some more depth to your stand and gives different layers of focus, which encourages visitors to keep looking. You should also think about the way the visitors will move around and through the stand itself. Ensure there are obvious entry points and consider which areas are likely to get crammed and where you want attention to be focussed. So, you’ve got a great looking stand, but there’s still so many ways you can help your audience find you, before and during the show. Before the show, use your social media presence to promote your attendance. Most events now have a dedicated hashtag, you should use that as much as you can so visitors researching the show can see your posts and know you are attending. This will likely bring those people to your website too, so you might even make a sale before the exhibition! If you are having any special offers or deals at the exhibition, you should promote this beforehand so people remember they want to see you. Personal invitations are a meaningful way of reaching out to high-value customers, or even those that may have fallen by the wayside. 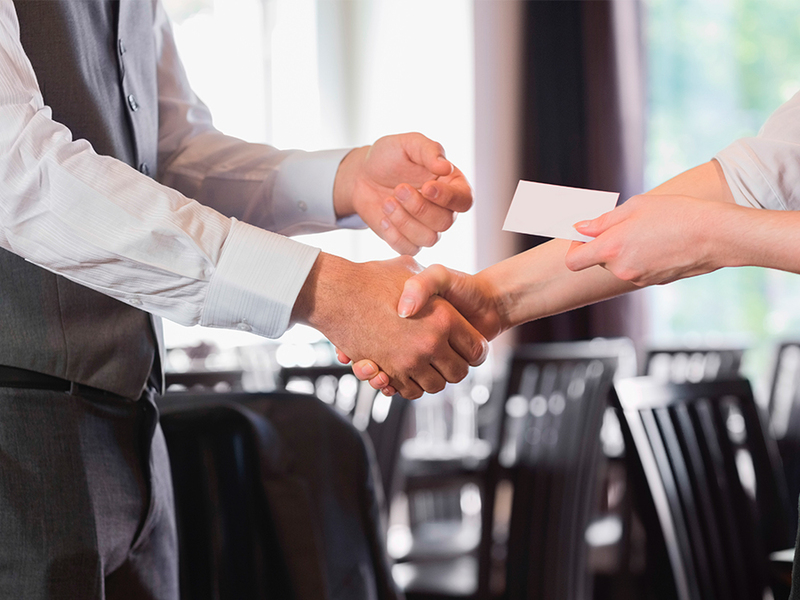 Personal invites make people feel valued and considered which creates brand loyalty. This is another opportunity to show off any show-exclusive offers. You can also use a combination of high and eye-level signage to indicate your position. Alternatively, use flags to really show off. Use a combination of signage with your stand for maximum visibility. Make sure you carry your branding through to create a distinct identity and easy-to-recognise exhibition space. Make it clear to passers-by what service or product your company offers. You need to find a balance between being open and clear, but keep enough back so that they need to get a bit closer to know more. Don’t give it all away in the first look; entice them in then give them more information. Give visitors more info with flyers and leaflets. You can use these to advertise special offers and show exclusives. Once you’ve got their attention, you need to be able to follow up quickly before you lose them. You can do this using printed materials like brochures and leaflets – or even show off your portfolio in a branded presentation folder. These are really beneficial for people who want to know more but don’t necessarily want to chat, or to hand-out for more information. And of course, don’t forget business cards! 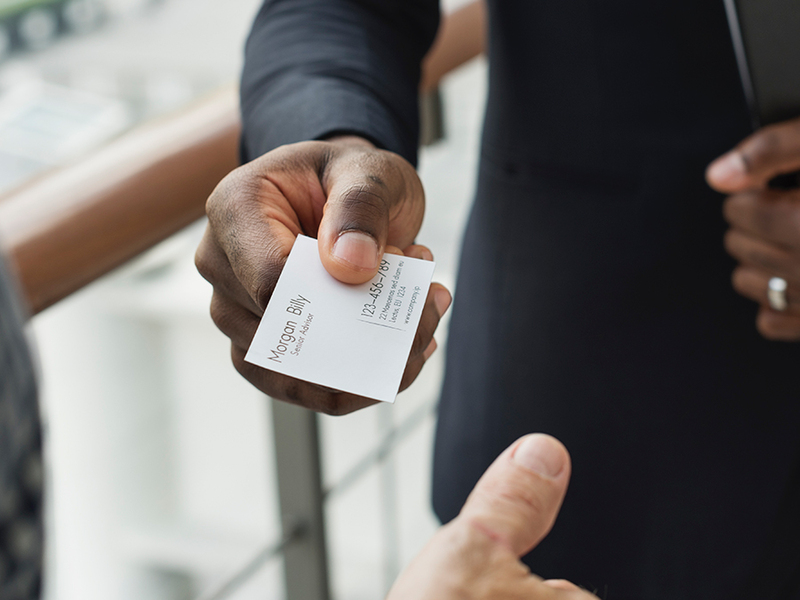 Nothing has quite the same impact as a business card; whether it’s to introduce yourself or encourage contact, or simply as a quick hand-out item, business cards are a must of everyone. Everybody loves a freebie – you can’t deny it. But just giving away anything to try and get attention will not work and is just a waste of money. Your giveaways should be useful and relevant, or it’ll end up in a drawer never thought of again. Consider items like pens or notepads. People use these items all the time, so use this opportunity to gain valuable advertising space. These are also a low-cost option, starting at 35p and 48p each respectively. Give your visitors something to see, touch, hear or even taste, to create a memorable experience. A visual demonstration of a product is a great way to show off what you and your products/services do. A demo will attract people, and that crowd will attract more people who want to see what’s going on. This is where you’ll be glad you mapped out your space beforehand, and have enough signage so everyone can see! When to prepare for an exhibition? 28% of respondents started preparing their marketing 1-2 months before their trade show, with 22% said 2-4 months. 18% said 4-6 months before and 19% 6-12 months before the show. According to Display Wizard, 6-12 months is the recommended timeframe for custom-built exhibition stands or other more elaborate displays. However, our exhibition stands are printed and delivered in seven working days; saving you up to a year! We have everything needed for a successful exhibition. Our low-cost products and super-fast turnarounds means that exhibiting is for every business. 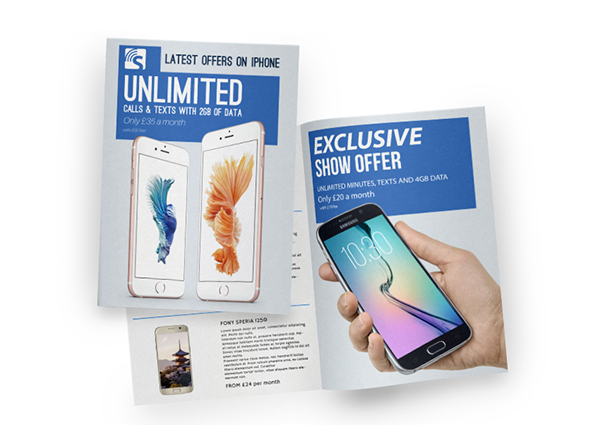 Get in touch today to see how Solopress can make exhibitions an easier, more worthwhile marketing tool.